2019 there will be "No" annual banquet. Last spring, we sent nearly seven hundred letters to members and banquet attendees seeking more active membership. Unfortunately, we received almost no response – we need some help! Our banquet chair position remains unfilled. We are actively seeking a banquet chair to run the banquet for 2020. We remain in a very strong financial position and have an experienced local board/committee. We still are actively seeking to find more active members. It is our goal to have a membership event again in 2020 but we need your help. Please contact a board member if you'd like to join the banquet planning committee. We would also like to take this opportunity to thank all of the people who have made the last 30+ years such a great success. Without all of the sponsors, people and or businesses who donated time, money or merchandise, everyone who works at the banquet and of course all the people that come to the banquet, none of this would have been possible. We were fortunate to have a very dedicated group of men and women that helped each and every year to transport and setup the truckloads of prizes and banquet supplies. We had some good times during setup and banquet nights. We hope this tradition can resume in 2020. We will be having the "Hunters Dream Raffle" yet this year. For tickets and information. See "News tab - Featured Post" to get details which will be posted in the next few weeks. Please read latest Banquet News update on News section. We will be having the Hunters Dream Raffle for 2018. No Banquet will be held in 2018. Thanks to our sponsors, donors, volunteers, committee members, and of course the generosity of our members, the 30th Annual Banquet was a success. With over 400 people in attendance, nearly every seat was accounted for as well as over 35 guns were given away. Brown County Pheasants Forever raised over $25,000.00 at the 30th Annual Banquet. That’s $25,000 to support youth outdoor endeavors, acquire habitat, and most importantly, improve the lot for pheasants and other wildlife in Brown County, Minnesota. After all, that’s really what it’s all about. Thank you and see you in March 2018 for our next event. 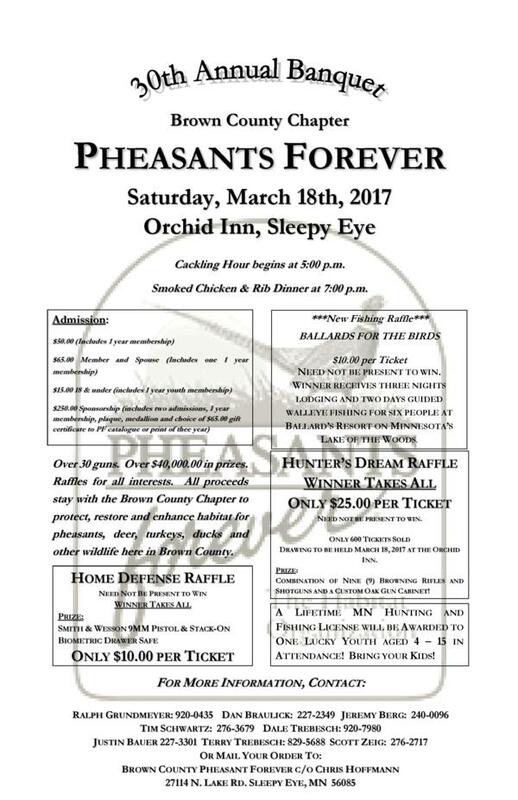 On March 18th 2017, the Brown County Chapter of Pheasants Forever will hold our 30th Annual Banquet at the Orchid Inn in Sleepy Eye. It was attended by over 400 people, our Banquet is our primary fundraising tool. 100% of these funds stay with the Brown County Chapter, to be invested by Brown County PF for habitat projects. Our banquet is wildly successful and has resulted in Pheasants Forever, Inc., investing nearly $3 million in Brown County since our founding 30 years ago. Of course, we owe the success of our organization to our donors, volunteers, and most importantly, members like you. Brown County Pheasants Forever is in a unique position among conservation organizations. Through your membership and our relationship with Pheasants Forever, Inc., Brown County PF’s parent organization, your chapter has access to hundreds of thousands, if not millions, of dollars for habitat acquisitions and restorations. Pheasants Forever, Inc., has proven itself capable of delivering low cost, high quality conservation results and for that reason, is entrusted to administer millions of dollars of Outdoor Heritage Fund (dedicated sales tax), North American Wetland Conservation Act (NAWCA) and other grant funds each year. This is particularly important in these times of high land prices and declining governmental conservation commitments. If Brown County Pheasants Forever identifies a project, Pheasants Forever, Inc., will likely find funding, as it did most recently with the acquisition of what will be the an addition to Rosenau-Lambrecht WMA. With your continued support, that $10 or $20 you spend on a raffle can by leveraged by Pheasants Forever to create $100 or $200 in grant funding for projects right here at home. We thank all the attendees and folks who contributed to a great event. Hope you had fun and see you at a future Banquet. We are only a month away from the 2017 Brown County PF Banquet. If you are interested in helping please contact any member of the PF Board. We will be having similar fund raising activities like: The Hunters Dream Raffle; The Home Defence Raffle; and the Ballards for Birds Raffle. Typical Banquet event has at least 30 guns auctioned or raffled off. As well, a Live Acution will take place for a number of selected items. As well for the sixth consecutive year will be auctioning off a Lifetime Youth License to one lucky winner. This year the event will be catered by North Star BBQ. This is a new change to the food line up. For those who have not tried this, are in for a treat. Ticket price will be the same as last year and will be posted in the next month. 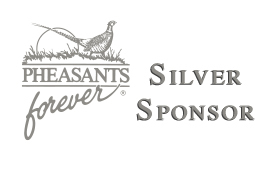 $225.00 Silver Level you will recieve (2) ticket to the banquet and (1) annual membership to Pheasants Forever. $275.00 Gold Level you will will all the benefits of the Silver Level plus, your choice of the Print of the Year (Unframed) or $65.00 gift card. $400.00 Platinum Level you will recieve all the benefits of both Silver and Gold levels and the Print of the Year will be framed. See you at the event March 18th, 2017 at the Orchid Inn, Sleepy Eye, MN.